Nope, didn't do the marshmallows yet! In fact, dinner time was the first time I sat all day..ouch my back! Roasted some of those monster chicken breasts you get these days, chopped it, added onion, celery, mustard powder, splash of oj, packet of Geo Washington gold, s&p, and mayo..
Dinner was ribs done low and slow, and some steak and broccoli over rice..
And I made a trio of pot pies since I was roasting chicken breasts anyway. I will bring one to dil...I will see her at the Baby Shower for her sister tomorrow...an hour away..and the others for friends.. So that was the day! Doesn't seem like much accomplished..but I was busy all day! Last night we had dinner at a friend's house. People we have been friends with for over 35 yrs...4 couples. A delicious standing rib roast was the main course. Always fun to be with old friends! So I will be on the road again tomorrow..
Have a great Saturday, everybody! 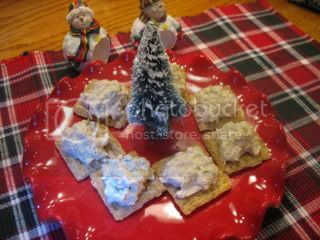 kathleen just those crackers would be my cooking and dinner for the day, i kept scrolling and my mouth dropped open! it looks daunting to say the least! 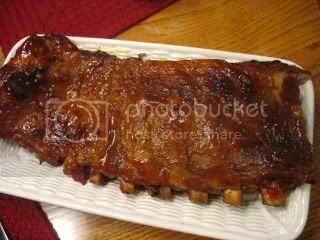 oh i would love those ribs, i never make them but sure love them! and then 3 pies?! you go girl! you and cynthia are the most active gals around! you could have whipped up the marshmallows in your sleep, you are a pro at all this stuff! Kathleen, WOW, I'd be surprised if your back didn't hurt after all of that. ... Ribs and steak for dinner, my carnivore husband would love that. (And will never get it from me.) 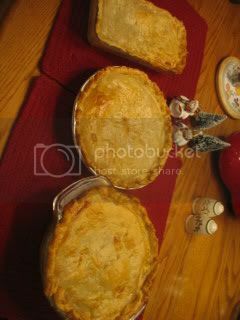 And the potpies, lovely. I hope your DIL realizes what a gem she has for a MIL. Hope you have good weather for your drive to the baby shower. Jain is correct about you ... you are so active, like the Energizer bunny. You got a ton done today! The food looks fantastic. I would love some of those ribs in a NY minute, Kathleen! Enjoy the shower tomorrow, the weather should be good! You can do the marshmallows, no prob :) The gkids will love them! Doesn't sound like much accomplished? You've got to be kidding :) Those ribs those fantastic. What is Geo Washington Gold??? Carol, yes the weather sounds ok...I'd rather stay home and get sticky with marshmallows though! I take a nap sometimes, always did when I worked if I could..
Betty, the picture looks great! You figured it out! I don't leave the oven on when I'm out. Not even the crock pot. And thank you, it looked like "Santa gone Gigundo" for a while! 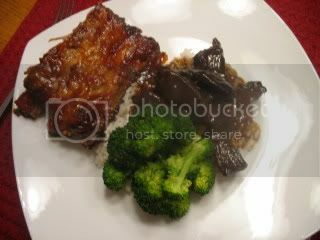 Now tomorrow I need some more help from you Bloggin Betty's! Your blog is looking great Kathleen. Your chicken salad has me craving it, so I am using the last of the turkey to make something similar. I am glad Susan asked about the Geo Washington gold. I was going to do the same. 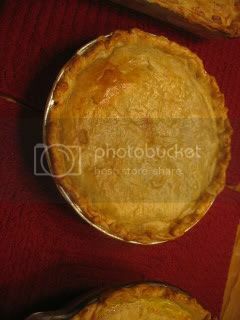 Ribs are making my mouth water..... And how sweet are you to share you beautiful pot pies. Love your header photo! That's not from this year is it? Suzy, that's from last year...but they say we are going to get some snow tonight..not too much I hope! Kathleen - you make me feel like such a lazy person..and you think you didn't accomplish much!!! What vitamins do you take..lol Everything looks so good..from the chicken salad - ribs - and my fave pot pies!! You are catching on to this blog very fast and I have a feeling it will be a fav!! Kathleen, you are super woman! The tablesetting, baking, cooking, shopping SUPER WOMAN! Everything here looks fantastic but boy do you have me craving ribs now. Thank you for starting Cuisine Kathleen - I love the header with baker Santa too! I think you are a gemstone nana. You did a lot! I get like that too..and wonder how J can just relax..I wish I could..
Everything looks delicious.Good food..I love the big header also.